Admit it: You can't turn away. The rebirth of Michael Vick—the most compelling story of the 2010 NFL season—is forcing the league and its millions of fans to confront uneasy questions about crime, punishment and personal redemption. Coming off a turbulent season as the Jets' backup quarterback, Michael Vick remains unsigned as he turns 35 this week, but his triumphant career revival with the Eagles five years ago set off a national conversation that persists to this day about how the off-field transgressions of star athletes should be received. This story originally appeared in the November 29, 2010 issue of Sports Illustrated. To subscribe to the magazine go here. Buy a framed copy of the cover here. The Michael Vick story? Everyone has a version these days. The young teammates who grew up pretending to be him, the old coaches mesmerized by his jaw-dropping talent, the faithful raving about his big heart? Click on any sports channel. The skeptics recounting the failed drug test, the raised middle fingers, the tricked-out water bottle, the Ron Mexico nom d'amour? Turn on talk radio. Those who will never forget that Vick illegally bred, tortured and killed fighting dogs with those oh-so-gifted hands? Yes. Everywhere. They're all at it again. Now that his comeback has taken on a seemingly unstoppable momentum, the Michael Vick story has become the irresistible talking point, refreshed each Sunday, refusing easy answers, touching on nearly every theme under the American sun. Take your pick: His pivot from inmate 33765-183 to Philadelphia Eagles superhero is about the public's ability to forgive or its jock-sniffing blindness or its short memory. It's about man's ability to change or to lie, paying one's debt to society or getting away with murder. It's the triumph of greed over principle, or mercy over horror. It's about loaded words like gullibility, redemption, fame and trust. What you won't hear much, at least as long as the 30-year-old quarterback keeps piling up wins like the Eagles' 27–17 victory over the New York Giants on Sunday night, is how the Vick story is also about stupidity and gut-jangling fear. Because Vick's own version is earthier, far less conceptual, than most, featuring a snarling confrontation that he was sure would end this latest, triumphal chapter before it even began. At around 2:30 a.m. on June 25, Vick sat clutching his weeping fiancée in a Virginia hotel parking lot, mind ticking off the new loaded words about to hit the airwaves—argument, co-conspirator, gunshot wound—and thought, My God. This is about to be a disaster. Hadn't his mother warned him? And all because of birthday cake. Still, though he crafted three quarters of astonishing athleticism, that wasn't the night's revelation. Spectacular for Vick is nothing new. “Nothing he does surprises me,” said Jim Mora Jr., Vick's coach for three years in Atlanta and now an analyst for NFL Network. “I've seen it.” What's different now is Vick's discipline, the control he wields over the offense and himself. Vick torched the Redskins for 333 yards and six total touchdowns on Monday Night Football. There was one moment, midway through the third quarter against the Redskins, when Vick's football maturity revealed itself as a weapon nearly impossible to defend: On third-and-goal at the Washington three-yard line, Vick found the pocket collapsing, stepped left, pumped, scrambled right, reversed himself and then, for just a split-second, did something shocking. He stopped dead, planted. Wide receiver Jason Avant was watching from the back of the end zone: The Redskins were prepared for the usual scrambling pass or a bullrush to the end zone, anything but this—and they froze like rabbits in a viper's gaze. “They just ... stopped,” Avant said. Now Vick sighted him. His fourth touchdown pass, a rocket through the Washington statuary, looked as if it could have cracked a rib. That Vick has 11 touchdown passes, no interceptions and a career-high 62.8% completion rate and leads the NFL in passer rating at 108.7 is good news in Philly. So is the fact that Vick survived a ferocious Giants rush on Sunday at Lincoln Financial Field in Philadelphia, ran for one touchdown and just skirted defensive end Osi Umenyiora's outstretched fingers to launch the fourth-quarter, fourth-down, game-winning pitch to LeSean McCoy that put the Eagles alone atop the NFC East at 7–3. That he is texting friends he's going to get better is bad news for opponents. But his can only be a football story until the game ends, and that presents the league—and the public—with a thorny problem. 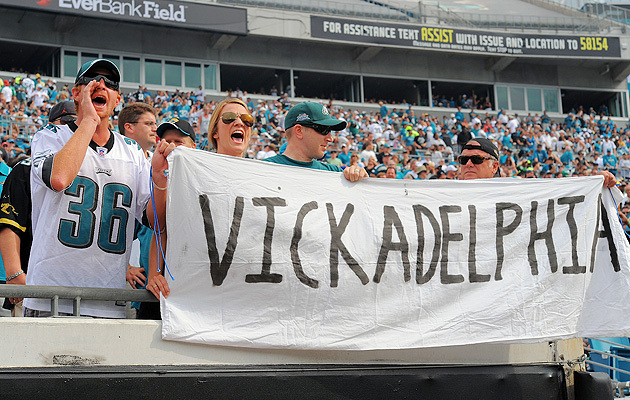 The Eagles' last two games were much-hyped events, and Vick's rise will continue to boost ratings. But in a season of middling teams, few breakout players and the numbing travails of Brett Favre and Randy Moss, does commissioner Roger Goodell really want the Vick narrative to hijack the conversation, making a convicted felon—a man many believe is a sociopath—the new face of the NFL? As long as Vick remains healthy it may be inevitable. Because, really, who's not going to pay attention? The Vick paradox is simple: You can't look away from the beauty, and you can't quite forget the brutality. His game is rivetingly kinetic, and now that Vick's commitment to football is making itself evident, it's impossible not to wonder how good he can be. Yet his infamous stewardship of the Bad Newz Kennels created a discomfort that has endured longer than the usual distaste for bad actors. On Thursday, Goodell stopped in Philadelphia and, 14 months after he lifted Vick's playing ban, spoke of the “message” behind Vick's rebound, the “lessons” to be learned. “We need our kids to see that kind of success story,” Goodell told The Philadelphia Inquirer. “This young man has turned his life around, and he's going to contribute.” But Vick's tale is not that tidy, and it's far from finished. It wasn't even halftime of Vick's Monday-night rampage against the Redskins when Arizona Cardinals defensive tackle Darnell Dockett tweeted, “Vick doing so good, he got dogs cheering for him.” Afterward Jackson, the Philly wideout, said the pregame Eagles had been “like pit bulls, ready to get out of the cage,” and the snickering hasn't stopped yet. The next morning a New Jersey woman hit the streets with her bulldog in a shirt that read MICHAEL VICK: NEVER FORGET. 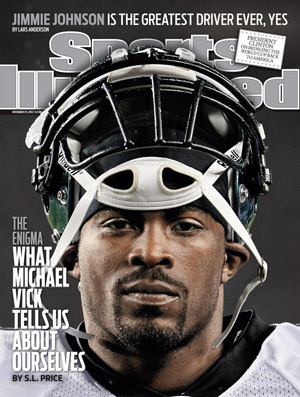 The Eagles signed Vick in August 2009, an unpopular move that they are still defending. Even Vick's actual 19-month prison term is hardly a thing of the past. Off the field, of course, he must follow the prescribed dictates of his probation. (Among them, to the dismay of one of his daughters, he is not to ”engage in the purchase, possession or sale of any canine.“) But it's a daily factor onfield too; to hear him tell it, Vick would not be the new, spongelike student of the game, the one watching extra film and doing extra work, if he hadn't been locked up. He'd been a classic last-in, first-out locker room presence before that, skating by on talent alone, his car littered with unwatched game film, living “a lie,” as he told Mora in their extraordinary exchange last month on NFL Network, “everything from A to Z.” Only prison forced him to change. Which may be, in the end, the most disturbing idea of all. Because if Vick is poised to challenge Tom Brady or Peyton Manning as the best quarterback in the game, it represents no small shift. There's a cultural heft assigned to the NFL's premier quarterback, the same kind of iconic significance once piled upon Mercury astronauts or Yankees centerfielders. And the implication here is simple. People speak of being conflicted about watching Vick, hating his crime and loving his game, as if the two can be separated. They can't. Think about it: Can it be that only hard time, earned by vile acts, made Vick the player he is now? For Vick to touch greatness, did dogs have to die? 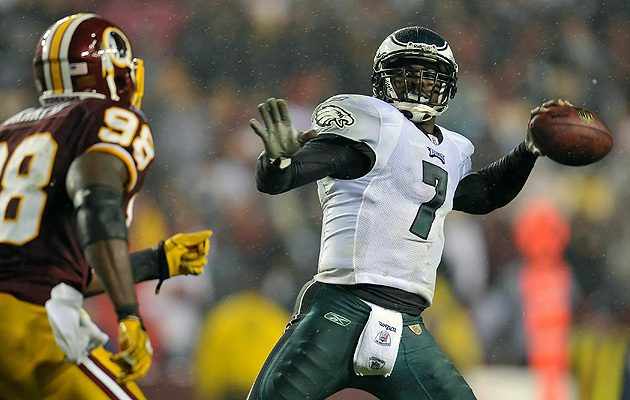 Three games into 2010, Vick had swept up Eagles fans in a wave of optimism. As long as he keeps playing, and winning, those questions and that uncomfortable sensation aren't going away. We're seeing something special now but have no choice except to hear, amid the highlight banter and the roaring crowd, a sound rise as if from the cellar. The scrape of tooth on bone: It, too, is part of every wondrous pass, every perfect decision Michael Vick makes. Vick had plenty of motivation to show the world a new side. He needed a job. Once he had been the NFL's highest-paid player, but now his coffers were drained by mismanagement and his support of at least seven family members, including his mother, Brenda Boddie, and brother, Marcus, and the endgame combination of staggering legal fees and loss of income. In 2008 he declared bankruptcy. He reportedly still owes creditors $20 million. Still, over the summer of 2009 Reid didn't rush with the idea to his bosses. He made more calls. He gave Vick time to build a résumé: working construction, giving cautionary lectures for the Humane Society, staying straight. He asked Britt if he'd be "crazy" to bring Vick in. "You've got to talk to him," Britt said. "You can talk to all these other people, but that doesn't matter. You've got to talk to him, see if he's in that frame of mind where he's saying, 'I'm done. I'm going to do whatever it takes.'" In August the Eagles quietly flew Vick into Newark, not Philadelphia, and his fiancée, Kijafa Frink, drove him to Lurie's Philadelphia home for a six-hour meeting. Lurie, owner of two dogs—one a Great Pyrenees rescued from abusive owners—watched Vick take his grilling about his upbringing and “heinous” acts. He watched Vick, who discovered chess in prison, challenge and then lose to his 14-year-old son, Julian, a former tournament chess player, in a 90-minute battle. He left for that night's preseason game convinced. “I felt he understood how horrible that culture he participated in was,” says Lurie. “It wasn't just what he lost.” Yes, Vick had every reason to be at his humble best. "That was the judgment call: You didn't know," Lurie says. "Of course he could say all the right things. That's why I tried hard to read his eyes and expressions. You can read someone's genuine empathy or warmth or regret; it's hard to fake. Even the best actors you can see through. I could really see an amazing regret, a terrible regret." There were, to say the least, skeptics. Word of the impending deal leaked during the second half of that preseason game, and one of Lurie's closest friends, a prominent animal activist who'd been sharing fall Sundays in his owners' suite for years, turned to him, aghast. “How can you bring in somebody who tortured animals?” she said. She hasn't been to an Eagles game since. The team's front office was deluged with protests and hate mail, but as the 2009 season progressed and Vick proved to be a diligent, if unimportant, third-string player, the furor faded. [daily_cut.nfl]Yet as the 2010 off-season unrolled, one key figure still wasn't convinced: Vick's mother. He had made $1.6 million in his first season in Philadelphia, and last March the Eagles exercised the $5.25 million option for 2010, with about one third of that guaranteed. Vick began making the rounds near his house in Virginia, staying out late, hosting parties with Marcus, putting himself out there where faces from his darker days could emerge. Brenda didn't like it. “I let her down so many times,” Vick says. “Everything that ever happened, the reasons I ended up on ESPN in a negative light? She always told me, 'Stop doing it.' I never listened. Vick and Kijafa, the mother of his two daughters, arrived at the Guadalajara restaurant in Virginia Beach about 12:45 a.m. on June 25. The plan was for them to have a couple of drinks, sing Happy Birthday and leave. But when Kijafa thought it'd be cute to smear cake on Vick's face in front of some 400 people, his temper flared. Then up stepped Quanis Phillips, Vick's codefendant in the dogfighting trial. Phillips grabbed the cake and shoved some into Vick's face too. Bad enough that probation, not to mention Image Management 101, bars the two men from being in each other's company. But to insult him in public? Vick grabbed Kijafa and they drove off. Fifteen minutes later he received a phone call saying that Phillips had been shot in the leg at a nearby parking lot, two minutes after Vick's departure. Kijafa burst into tears, apologizing. Vick called his lawyer. The couple barely slept, Vick sure he'd blown his chance one minute (hadn't Goodell and Lurie vowed he would have no margin for error?) and hoping for reprieve the next (didn't he leave when things went crazy?). Separate league, team and probationary investigations would later back Vick's versions of events, and the police dropped the investigation because of a lack of cooperation from witnesses and Phillips. But at the time Vick's future looked grim. The next 24 hours were wrenching. Vick had to face kids at a football camp he'd been hosting at Hampton University, kids he'd been telling to live the right way. Burning with shame, he cried going in and coming out. Vick steeled himself to call Reid, whose explosion left him blistered: “You shouldn't have been in that environment.... You shouldn't have been out after 12.... I don't know where this is going to go.” Vick then dialed Dungy but lasted only five seconds before hanging up in tears. The next call? It should have been Goodell. Vick didn't dare. Then came his mom, the absolute worst, laying into Michael and Marcus at Vick's Hampton, Va., home. 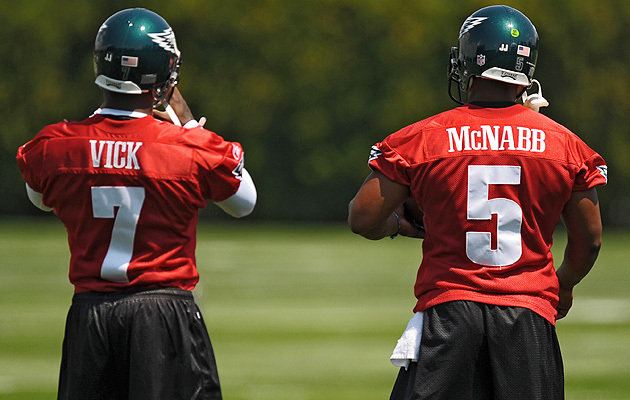 The furor following Vick's signing faded as the 2009 season wore on and he remained buried behind McNabb and Kolb on the depth chart. Vick got help with that, a nudge that's rippled out to rework the fabric of this NFL season. Because everyone credits Vick's work ethic from last summer—extended workouts, sessions with Eagles offensive coordinator Marty Mornhinweg, extra film work—as the foundation for what came next: the McNabb trade, Vick's startlingly high level of play after taking over when Kolb went out in the season opener with a concussion, what's happening now. None of it might have occurred if Phillips hadn't been shot and Vick's probation officer, on the day after Vick's birthday, hadn't ordered him to leave Virginia and plant himself in Philadelphia. Has he changed? That's the question haunting Vick still. Out of a tunnel he emerged on Sunday night, wreathed in smoke for the pregame introductions, palms pressed together in the classic steepled expression of prayer. He crossed himself, heard his name called, ran onto the field in Philadelphia amid loving cheers. Was it just a show? Two days before, Vick was sitting in an office at the team complex, detailing his summer's error and shame, how he cried that one day more than his entire time in prison. “More so the reason why I feel so blessed now,” he said. Was it just words? Vick won't go that far. He's no longer the kid sure he could get away with any transgression. Friends say he seems “free” for the first time, unburdened by the distractions of hangers-on and activities he couldn't resist, but there's also a liberation that comes when the worst has come and gone. The world knows all the bad things Vick has done, yet he's still alive, admired, still able to make a living and play a game he loves. But he tells himself that he's one misstep away from losing it all. Can he stay out of trouble? The more Vick wins, the higher the stakes rise. The more fans buy in. The more cynics say it's a con. The more viewers find themselves forced to take a stand, to comb through questions about race or justice or, God knows, the mystery of human nature. “You hope,” Vick says, and maybe it's just a figure of speech. But it's true. We, watching, are a part of it. The longer it continues, the better it gets, the more the Michael Vick story becomes about us.